Looking for a new career? Join our team and build the life you want while helping your neighbors build theirs. Earn more money with a challenging and rewarding career in real estate. Flexible schedule. Work from home. High Income. Work-Life balance. New challenges. New rewards. The Dart Homes new agent program is strides ahead of the competition with on-the-job training, business planning, scripts, weekly coaching, and mentoring to help you launch a successful real estate career. We won’t hang you out to dry or force you to spend hours cold calling or spending money on dead leads. We will enable you to be confident, knowledgeable, and professional when dealing with clients and offer the level of service necessary to building your reputation. We want you to be someone all of your friends and family will proudly recommend to everyone they know. Flexible: In real estate, no day is the same, with new challenges and opportunities cropping up regularly. You have to be willing to give up some nights and weekends and be available for your clients when they need you. Ambitious: Like any other flexible career, the flip side is that if you don’t have a go-get-em attitude it’s hard to find success. But if you are willing to put in the work, the opportunities are endless. Skilled Communicator: Even if you have the knowledge, if you can’t communicate it then it doesn’t do it any good. Our job is to educate clients about real estate transactions, talk them through decisions, guide them to their best choices, and help them over challenges or disappointments. People Person: This job is about people, so you have to love them. You have 2+ years experience in a customer related field. Eager to Learn: No transaction is the same, so you have to be able to think on your feet, ask questions, and be ready to learn. Integrity Powered: In an industry rife with gimmicks and shady practices, we pride ourselves on being different. That means we don’t take shortcuts and we always put our clients first, no matter what that means. Real Estate Savvy: You must have a real estate license or be able to get one prior to starting. Local Expert: Your neighborhood is your playground, so you must have area knowledge to act as a guide to your customers. Work deals: Once you’ve got some time under your belt, you will work to help buyers find a home. You’ll have a team of experienced professionals to support you, from in-house marketing, client care coordinators, and a mentor to help you through any bumps along the way. Teamwork: We are a team, so that means we support and help each other any way that we can. If someone has a schedule conflict, or is out of town, you have to be willing to help out, knowing that favor will be reciprocated down the road. Educate: Your main job as an agent is to educate your clients about what they think they know, but really don’t know about real estate transactions. Customer Based: With Dart, you have all the support you need in order to really focus on serving your clients. Dart Homes has been trailblazing since 2008 from the heart of Montgomery County Maryland. Our high-energy style, cutting-edge content, and impeccable integrity form the foundation on which we have built this team. Every year, we help over 140 of our future friends and family through the transformative experience of buying or selling a home – but it doesn’t end there. 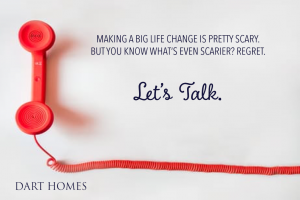 Our relationships last longer than the length of a transaction because our goal is not just to make a home sale or purchase easier, but to make life better! If you are interested in joining us, please send your cover letter and resume to team@darthomes.com with new agent career in the subject line.